We loved painting the wooden figurines in the gift shop, and that was certainly unique! Very far parking from our hotel room and it cost $20 a night to park. If you really want to live the Walt Disney World experience, booking hotels in Lake Buena Vista are the best way to get the most from your vacation. By booking into Lake Buena Vista hotels, you’re just a shuttle bus-ride away from all the glitz and glitter of the world’s most famous theme park. That means you and the kids can enjoy all the parades, rides and entertainment from the moment you wake up, to the moment you go to sleep. With some of the best rides in the business and a stream of Disney characters on show, it’s no wonder that Walt Disney World attracts more than 20 million visitors every year. If you’re wondering where to stay in Lake Buena Vista, you’ll find an extensive range of accommodation designed to cater to all tastes and budgets. 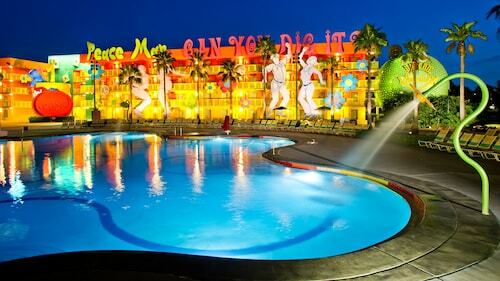 If you want to save your money for the theme park, the All-Star Music Resort offers Lake Buena Vista hotels at wallet-friendly prices. In addition to its own pool, this resort offers comfortable, themed rooms, an arcade and a food court in which to enjoy a post-parade meal. For a slice of Disney-style luxury, the Grand Floridian Resort & Spa is ideal. Themed after the atmospheric Victorian era, this resort offers spacious and delightful rooms, on-site restaurants, a gift shop, a pool and its own beach. If that wasn’t enough, the resort also acts as a stop for the park’s monorail, giving easy access to your favorite rides, slides, parades and shows. However, if you’d like the option to leave Disney World behind you at the end of the day and explore further afield, the Clarion Inn is just 15 minutes away, offering family-friendly accommodation in Buena Vista, and with the option to bring your pet. While the theme park’s rides, performances and processions tend to be the reasons most people visit Disney World, Downtown Disney is also an attraction. However, instead of roller coasters and waterslides, you’ll find an array of Disney-themed shops, diners and restaurants. Don’t be fooled into thinking this is exclusively for grown-ups, either; you’ll find plenty of stores and entertainment for younger visitors, too. The Disney Dress Shop is ideal for little Cinderellas, while the Disney Home store allows you to add a splash of color to your home. The WonderGround Gallery is packed with exciting examples of Disney art; perfect for animation fans. If you find shopping a bit of a chore, there’s plenty of onsite entertainment. Head to the Splitsville Luxury Lanes for some serious bowling, or unleash your inner Jedi by trying your hand at Star Wars: Secrets of the Empire. If you’re staying in one of the many hotels in Lake Buena Vista, you’ll have access to the theme parks until they shut down for the night. To enjoy every aspect of the experience, it’s worth setting aside an evening or two to dine out in one of the nearby restaurants. The Liberty Tree Tavern is perfect for families, offering Thanksgiving-style dining every night of the week. It’s set in the Liberty Square part of Disney World and is a colonial-style tavern staffed by costumed characters. Beauty and the Beast fans will jump at the chance to dine inside the Beast’s castle, which serves French food in gorgeous surroundings. Since it’s the Beast’s home, there’s magic everywhere: look out of the windows and you’ll see it’s snowing, whatever time of year you visit, and the suits of armor are surprisingly chatty. For dining under the sea, head to the Coral Reef Restaurant, where you can enjoy a leisurely dinner while watching the shimmering shoals of tropical fish that swim in front of you. After dinner, visitors can return to their Lake Buena Vista hotels and rest up before another day of excitement dawns. It's Disney, so of course it's terribly expensive and the rooms are tiny. Otherwise, the service is outstanding and the rooms were very clean. They recently renovated this resort and the new room layout is quite nice, making the most of the small space. Everything is ok. But the rooms should need antes update.